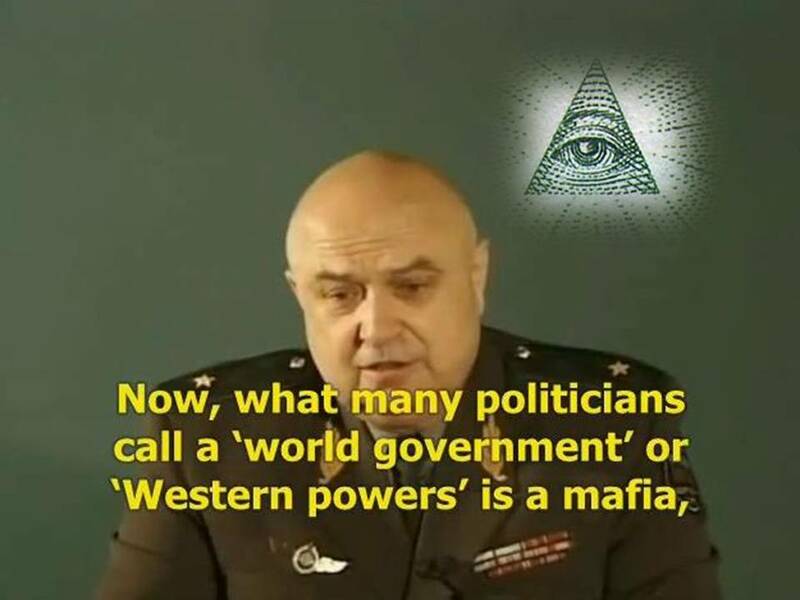 - The end of the hegemony of the dollar in the U.S.
- The orchestration 9-11 attacks in America to participate in a war, the forces behind the premeditated action by politicians for the impending collapse of the United States of America, as we know. Member of the International Academy of Informatization and president of the Bureau of the Central Committee of the party "Path of Truth and Unity" and head of the Udmurt State University. 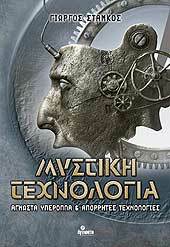 In an era when the electrical networks, electronics, automation and computers are vitally necessary for the function and survival of a modern society, a weapon that would harm irreparably the electronic infrastructure of a country would have been worse, and the explosion of a atomic bomb! The "exotic" this weapon, developed in complete secrecy in the past two decades, is already available in the single global superpower. Called Electromagnetic Bomb (E - Bomb) and is considered by many analysts as the "ruler of the next war." However, because the electromagnetic bomb is relatively simple to manufacture and extremely cheap, many fear that they might be and ideal weapon for terrorists. Does approaching an "electromagnetic Pearl Harbor"? Nuclear, biological and other "weapons of mass destruction" are the worst fears of humanity. However, some experts prefer last to worry about a little-known threat: electromagnetic bombs (E-bombs), which herald the era of dominance of non-lethal weapons (Non Lethal Weapons) in the conduct of military operations in the digital era. The only good thing with these new types of bombs that do not kill people, not destroy buildings and facilities. Yet electromagnetic bombs pose a great threat to technologically advanced countries like the U.S.. Considered invisible and instantaneous mass' killers electrical appliances. " They can cause an "electromagnetic Hiroshima" destroying a radius of several kilometers every electrical and electronic equipment: telephones, radios, televisions, computers, refrigerators, and radar, almost any device that has trantsistor, circuits and cables. Externally similar to any other normal bomb, except from that they have within them a large coil around the explosive device. The explosion creates the instant a powerful electromagnetic pulse (ElectroMagnetic Pulse - EMP), which is essentially an "animated short", which can send a technologically developed society back 200 years. This is seriously the Pentagon. The U.S., already incorporate electromagnetic bombs in their arsenal, not yet taken sufficient precautions to ensure the survival of their defense systems in case of electromagnetic attack by terrorists, much less from a hostile country. According to experts in defense technologies electromagnetic weapons launch a new era in the conduct of warfare and terrorist attacks. The possibility of some terrorist groups to attack the U.S. seriously concerned U.S. officials especially after the attacks of 11 September 2001 on the World Trade Center and the Pentagon. The Richard Clarke, occupying the new position of Director for the Security of Cyberspace (Cyberspace Security Adviser), created a special board to protect the survivability of vulnerable computer systems and communications networks in the country. Indeed some of these specialists made ​​clear that the electromagnetic could have brought the weapons of choice for terrorists. 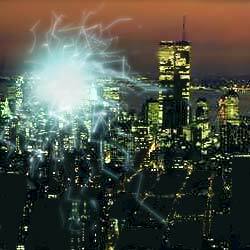 The destructive nature of the electromagnetic pulse (EMP) was discovered during the first test of U.S. nuclear weapons. When in 1958 an atomic bomb was exploded high in the atmosphere of the earth, the sudden release of gamma radiation in air resulted in the creation of a massive wave electromagnetic pulses. The lamps street lighting in Hawaii, hundreds of miles away from where the explosion went off abruptly and navigation of ships in the Pacific went off for at least 18 hours, while 72 hours was observed phenomenon of intense ionization of the atmosphere. The phenomenon of electromagnetic pulse observed strongly and 1962, during the testing of an American atomic bomb force MT 1.4. The detonation of the bomb, which was at a height of 40 km above the Johnston Atoll in the Pacific Ocean, resulted in about 30 minutes in blocking off the radio and satellite equipment for thousands of kilometers. Since the mid 1970's and during the 1980's the U.S. and other nuclear powers, studying the effects of underground nuclear tests, sought ways to exploit the electromagnetic pulse (EMP) that is created in the process of nuclear explosion and is particularly dangerous for electronic equipment. Of course, it should be noted that the original theory for a device that will produce a non-nuclear explosion due to electromagnetic pulse (non-nuclear EMP) is charged to Dr. Arthur Compton, who in 1927, studying atomic particles, tried to inject plasma electrons. However, only in the mid 1980's scientists discovered how to construct a high-energy device, which would generate an electromagnetic pulse without using nuclear explosion. The first test device demonstrated on immobilized B-52 aircraft and cruise missiles (Cruise Missile) with impressive results. The time of explosion device an electromagnetic field produced by electromagnetic induction, which was greater than that which produces a nuclear explosion! The phenomenon of electromagnetic pulse because of the power, is dangerous for sensitive electronic devices, particularly those based on semiconductors, microchips known us. Few electronic devices are commercially available, have sufficient protection to survive a large electromagnetic pulse. Radio transmitter, electronic ignition cars, computers and communications centers are ideal targets an electronic pulse. The first major test of an American bomb, based on an electromagnetic pulse, is scheduled for 2002. Not sure though, if this test is widely reported in the press. The U.S. Army hopes to use electromagnetic bomb in the form of artillery projectiles. The Navy wants to use it to neutralize the missiles fired against ships. And the Air Force wants to equip all the bombers and other aircraft as well as cruise missiles and unmanned vessels, with E-bombs, which are regarded as the most "sophisticated" weapon ever built by the U.S. war machine. These will be the masters of future wars. The electromagnetic bomb utilizes the law of electromagnetic induction of Faraday, that exploit the extremely sharp change in the magnetic flux to cause an intensive inductive current. Then this stream is passed to an antenna from which emitted a powerful electromagnetic pulse, which can be "fried" any electrical or electronic device within several kilometers. 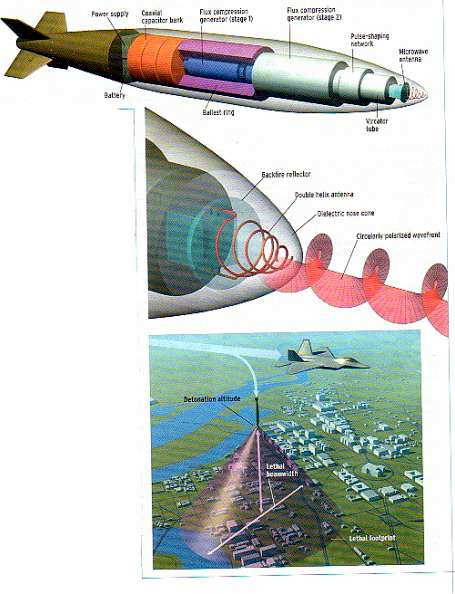 The mechanism of electromagnetic bomb based on the creation of a compressible Flow Generator (Flux Compression Generator) through an explosion creates a "shorted moving", which produces in a few microseconds an electric pulse intensity of tens of millions of amperes. More specifically, the electromagnetic bomb based compression of magnetic flux and induced current production-intensive. The compression created by the initial burst, which gradually destroys all the turns of the coil. The magnetic field is compressed and constantly pushed towards the front end of the bomb, where the antenna. When it reaches the inductor current in the antenna crushed and created one incredible intensity electromagnetic pulse. This electromagnetic pulse emitted frequency of several MHz, is valid between 1-10 TW (TeraWatt = 10 ² W) and lasts only a few nanoseconds, but enough to send an entire city in the preindustrial era! THE NEW "weapon of the poor"? Generator compressed Flow (FCG), is simple in construction, inexpensive and very effective in use. The mechanical instructions for making a compressed Flow Generator is simple and can be made ​​by anyone who has access to shops with mechanical and electronic products. Today, several universities in the U.S. manufacture innovative devices for better study the phenomenon of electromagnetic pulse to design non-lethal devices to be used by police to immobilize vehicles persecuted. 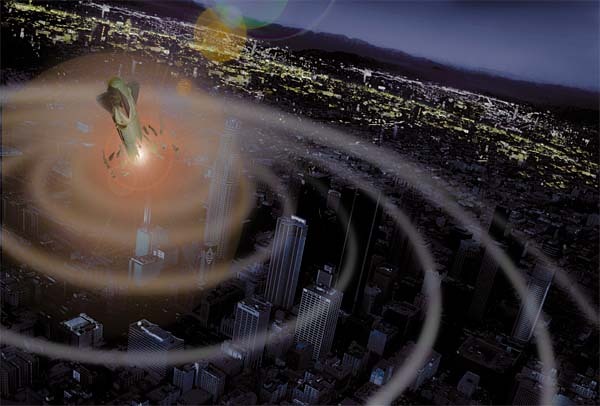 The explosion of an electromagnetic pulse device in the air or near the top floors of a skyscraper multiplies the damaging effects. The electromagnetic bomb is effective only at a specific distance around it. The larger the equipment, the greater the magnetic field it produces. An electromagnetic pulse device length 30 cm can affect local control centers, telecommunications systems. A 1 to 1.5 meter device can affect all communications and electricity networks at an airport or, if exploded atop a skyscraper could disable all devices based on semiconductors within several kilometers. The construction of an electromagnetic bomb, although it requires an intelligent combination of mechanical and electronic systems can be constructed even by a group of terrorists in during 6 months to 2 years. The estimated cost of 1.000 € for a small prototype and 10.000 € for a larger device radius of several kilometers. Indeed, according to some sources a compressed Flow Generator costs just 400 €! 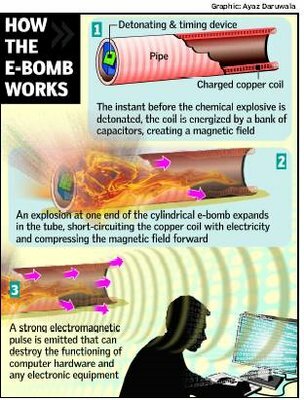 An apparatus electromagnetic induction is not only possible to manufacture with the current technological means, but is accessible even to terrorists. Terrorists can secure the device and from the black market. There are also countries that promote terror, like Iraq, Libya, Syria and North Korea have been able to build an electromagnetic bomb. Almost every country has a technology of the 1940's can be built on. The Indian Army is considering the construction Generators compressible flow because of fears that Pakistan, which is a long-running dispute over Kashmir, perhaps using electromagnetic bombs against the city Bangalore, which hosts the "Silicon Valley" of India. Apart from electromagnetic bombs are small and electromagnetic weapons for the "freeze" or neutralization of computers: a perfect weapon for computing era. Unlike electromagnetic bombs, which have great range and cause massive destruction (Device Killers), the more "surgical" devices TED (Transient Electromagnetic Device, Device Instant Electromagnetic Radiation), allowing instantaneous (within 100-200 picosec) emission electromagnetic radiation to the "hanging" or destroy some electronic parts of a computer target. In devices TED output high power is instant and for this reason they cost little and do not require large amounts of energy, while the relevant expertise is available to any library! Anyone could build a device TED's store house, while the materials are so common, it would be impossible to identify the buyers. These characteristics of the devices make them ideal for today's terrorists: radar, airports, hospitals, computers in business, telecommunications, etc. are just some of the potential targets unprotected. The David Schriner, a retired engineer weapon systems of the U.S. Navy subsidized by Congress on the amount of 1 million dollars, presented in 1999 at the conference InfowarCon 1999, a prototype of a device TED worth $ 300 which, the push of a button, "hung" two computers. The threat of proliferation of electromagnetic weapons are real. Perhaps the next terrorist attack be made ​​with electromagnetic bomb. At a time when Islamic terrorism is on the rise, electromagnetic bomb, with production costs just 400 €, could become the new "weapon of the poor." 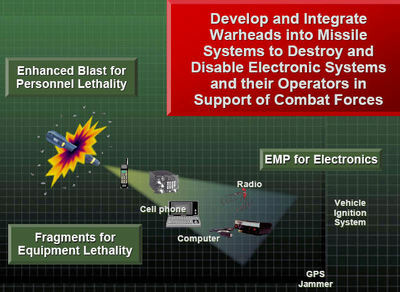 The U.S. war machine, which first incorporated in the arsenal of this bomb, knows the risks of leakage of electromagnetic bombs to other countries or terrorist groups, and already planning the yperexeligmena countermeasures, specifically absorption systems electromagnetic pulse, electromagnetic shields, nets Tesla technology and superiority. Perhaps the next "Pearl Harbor" can not come from the flash of a nuclear explosion or the outbreak of an Ebola pandemic or a genetically modified organism. At most, you might hear a faint click from a distance. Once everyone mistakenly characterize this sound as "innocent" one thunder lightning, human civilization will irretrievably broken. No this is not some imaginary doomsday scenario. Contrary is a realistic assessment of the damage the Pentagon believes could cause the use by terrorists of an electromagnetic bomb that will explode over a skyscraper in Manhattan. Within milliseconds, the heart of New York, a metropolis of global capitalism, it has returned to the pre-industrial era, as everything had electricity connection would be destroyed irreversibly. The damages would be the order of tens of billions of dollars. The terrorists would have dealt a mortal blow to the U.S. economy with zero casualties. The previous scenario described in detail by Jim Wilson, in an article published in Popular Mechanics magazine in September 2001, just days after the terrorist attack on the twin towers in New York. The U.S., which first incorporated in their arsenal electromagnetic weapons (in 2002), now living in fear of an electromagnetic attack. In the years to come might live a "Electromagnetic Hiroshima" that will usher in a new era of terror. Posted by ICEUJIN at 1:03 a.m. The Cybercrime Prevention Act of 2012 is the most notorious act ever witnessed in the cyber-history of the Philippines,and the language of the bill is cunningly designed to make you think it only applies to individuals who are deep in cyber-technology and doesn't apply to everyone, but some part of the bill basically says it can imprison anyone who commits libel either by written messages, comments, blogs, or posts in sites such as Facebook, Twitter, or any other comment-spaces of other social media in the Internet. New technologies give us new opportunities to connect with a lot of people not only in this country but all over the world. They can also provide us with a medium through which our political, public and even private views can have an immediate and direct impact on individuals, communities and even countries. It is just so disappointing that our government, in adopting our 80-year-old antiquated libel laws to the Cybercrime Law, again seems to have retarded our march with the rest of the world with respect to giving full force to the people's freedom of expression. What does it mean when food has been "Genetically Modified"? Genetically modified (GM), or genetically engineered (GE), foods are made from plants that have had traits in their DNA changed. Scientists take genes, the pieces of DNA that differentiate living things from one plant or animal and insert them into another organism. These plants are also known as genetically modified organisms (GMOs). The first crops to be genetically modified in the United States were corn, soybeans, and cotton. Many processed foods, which contain large quantities of corn and soy, contain GMOs. Other GM crops currently allowed in the U.S. food and feed supply are alfalfa, canola, chicory, corn, cotton, flax, papaya, potato, rice, soybean, squash, sugar beet, and tomato. If other GM foods are contributing to the rise of autism, obesity, diabetes, asthma, cancer, heart disease, allergies, reproductive problems, or any other common health problem now plaguing Americans, we may never know. In fact, since animals fed GMOs had such a wide variety of problems, susceptible people may react to GM food with multiple symptoms. The availability of Non GM food vs. GM food is about 50/50. Most "brand name," products and corporate giants genetically modify their foods. Is an American multinational agricultural biotechnology corporation. It is a leading producer of the herbicide glyphosate, which it markets under the Roundup brand. Monsanto is also a leading producer of genetically engineered (GM) Seeds. We Have put together a List of Email Address's belonging to those who work for Monsanto. Pretty Important Study that has been done on Live Rats Who were Fed A 100% GM Diet. What can you do to help bring down MONSANTO And urge that your country DEMAND Your food to be Labeled? Sign the Petition! Let's get this on a roll and Bring down MONSANTO and save the Future Generations to come. get ready to clean out your pantry!